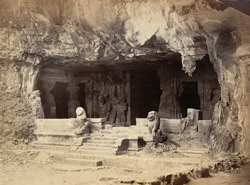 Photograph of the east wing of the Shiva cave temple of Elephanta in Maharashtra, taken by D.H. Sykes around 1871 in James Burgess' illustrated book 'The Rock-Temples of Elephanta or Gharapuri'. The great Shiva temple at Elephanta was excavated during the 6th century, Kalachuri period and consists of a series of chambers cut from the rock with entrances on the east, north and west. The square sanctuary is situated in a hypostyle hall with 20 pillars which is flanked by two excavated courts. This is a general view of the entrance to the smaller shrine to the east of the main temple, showing steps flanked by stone lions. On the back wall there is a large figure of dvarapala with two attendants. At the west-end of this portico there is a small cell with two pillars and two pilasters.